The Somerton House, built in 1908 by the Dominion Steel Corporation (DOSCO), is located on Town Square, Wabana, Bell Island, NL. The two-storey timber-frame building with an asymmetrical gable front is unadorned and utilitarian. The house as it was originally built was one-room wide and three rooms deep, with a shed-roofed porch at the back. It was heated by two wood/coal stoves. The stairway was located in the inner right hand corner of the front room. The side-gabled wing, with a basement to accommodate a coal furnace and storeroom, was added in the mid-1940s. 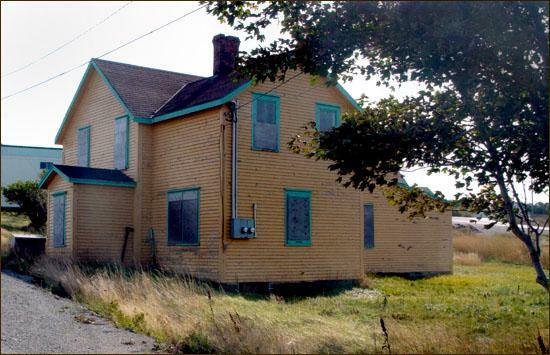 The house is rare among the former company houses in that there are only a few of this type left on Bell Island and no obvious cosmetic changes have been made to its exterior. Houses of its size were built for supervisory staff and most were located in small groupings along main roads near the company's Main Office. This house, however, was located away from other houses, near a group of company buildings which included the Record Office, Warehouse, Survey Office, Electrical Office, and Surgery. A view of the front and side façades of Somerton House. William J. Somerton was Chief Clerk of the Stores Record Office. Part of his job involved responsibility for providing rescue equipment in case of a mining accident. This likely explains his occupation of the staff residence nearest the Record Office and Warehouse. He paid $8.00 a month rent, which included all maintenance. Electricity and a telephone were also provided because it was necessary that he be on call to provide emergency equipment at any hour of the night or day. When the markets for Wabana iron ore started to dry up in the late 1950s, the Company began selling the houses to the occupants. The Somertons purchased their house in 1959, the year William retired after 49 years of service to the mining company. William J. Somerton was born in Portugal Cove in 1894 and probably started working at Wabana in the summer of 1910. He went overseas with the First 500 of the Newfoundland Regiment and was wounded at Suvla and at Beaumont Hamel. He was an active member of church and service clubs over the years, serving as church warden and on the Church of England School Board, as well as on the executives of the Great War Veterans' Association, the Loyal Orange Association, the Church Lads Brigade and the Canadian Legion. He married Ada Templeman, a school teacher at the Beach School, around 1922. They had six children and resided at their Town Square house from 1927 until his death in 1967. She continued to live in the house until 1991, when she moved to the seniors home on No. 2 Road. She died in 1997. The house is now owned by Gerard Dwyer. It has been immortalized in a 1992 mural painted on the side of the Loyal Orange Lodge. The mural is based on a 1961 photograph and shows the house looking just as it does today, right down to the paint colour. The Somerton house stands as a physical reminder of Bell Island's iron ore mining days and was designated a Registered Heritage Structure by the Heritage Foundation of Newfoundland and Labrador in October 2003. Also view the Somerton Property Registered Heritage Structure on the Heritage Foundation of Newfoundland and Labrador web site. The Newfoundland and Labrador Heritage Web Site has on its site only a portion of the registered heritage structures in Newfoundland and Labrador. To view a complete list or search for a particular structure visit the Heritage Foundation's Property Search page.